ELIZABETH CITY, N.C. – At Perry Auto Group we understand that purchasing a vehicle is a big investment. That’s why we want to help you take the best care of it. Routine maintenance and services are important for many different reasons. It prolongs the life of your vehicle, keeps everything running smoothly, and ensures your safety on the road. To give you the best experience in our dealership and online, we’ve updated our website. 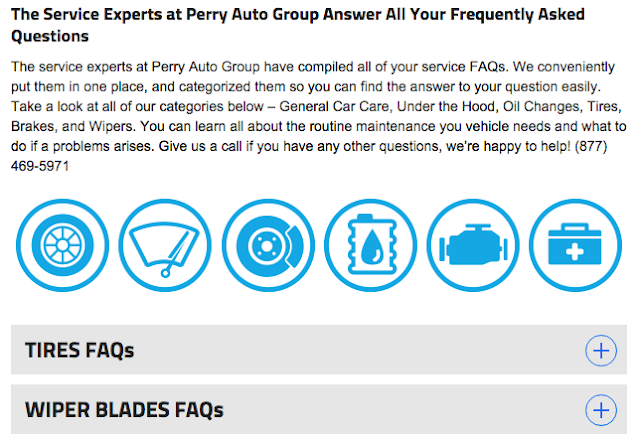 The service experts at Perry Auto Group have answered you service FAQs and categorized them for your convenience. To find all your questions and answers, go to our service page at PerryAutoGroup.com. If it’s time for your vehicle to get serviced, schedule an appointment with on online as well. General Car Care - In this category you will find information on the overall performance on your vehicle, suggested fuel types, and the essentials to pack in your car emergency list. Under the Hood – Find all the information you need about your car battery, alternator, and transmission in this category. Oil Changes – Routine oil changes improve the overall performance of your car. Learn about the type of oil you should put in your vehicle and how often it should be changed. Tires – Your tires get you to your destination safely and efficiently. Knowing the proper tire care and maintenance will go a long way. Also, read about the causes of wear and tear on your tires and how to check them. Brakes – In this section you’ll learn about the warning signs of worn out brake pads and rotors. Knowing the signs is important to avoid future damage and to keep you safe. Wipers – Your wiper maintenance can easily go overlooked, but having a clear view of the road is very important. This category will cover which wiper blades work for your car, and when you need to replace them. The service technicians at Perry Auto Group answered all of your service FAQs to give you more knowledge on your vehicle and the routine maintenance it needs. If you have any other questions that we have not answered, contact our experts at (877) 469-5971. If you’re in the market for a new car, stop by our showroom! We have a great selection of Jeeps, Chryslers, Dodges, Rams, and Chevrolets for sale.